Elementary school: 1963-1968, Sakarya İlkokulu, Milas, Turkey. Middle- high school: 1968-1975, American Collegiate Institute, İzmir, Turkey. University: 1975-1980, Hacettepe University School of Medicine, Ankara, Turkey. Internship: 1980-1981, Hacettepe Medical Center, Ankara, Turkey. Edinburgh Hospital Young People’s Unit, Edinburgh, U.K.
1990, Inpatient Child Psychiatry (visiting fellow), Harvard Medical School, Children’s Hospital Department of Child and Adolescent Psychiatry and JudgeBaker Center, Boston, U.S.A. 1990-1993, Child and Adolescent Psychiatry, Hacettepe University Faculty of Medicine, Department of Child and Adolescent Psychiatry, Ankara, Turkey. (Board Certification nu: 20). Program, Harvard Medical School and School of Public Health, Boston, U.S.A.
2002, Clinical Research Course, Children’s Hospital, Boston, U.S.A.
2002, Clinical Research Skills Workshop for Investigators, Pfizer Company, İstanbul, Turkey. 2004, Grant Writing Seminar, NIMH, Washington D.C., USA. Turkey, in collaboration with the International CBT Associaton, İstanbul, Turkey. 2006, Course on Basic and Advanced Pediatric Life Support, Hacettepe Univ., Ankara, Turkey. Certificate Course on Medical Education and Training, Boston, USA. 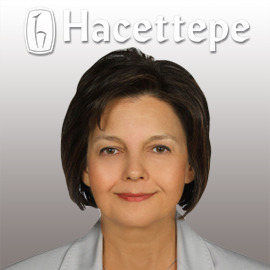 1993, Associate Professor (This is an academic degree in Turkey, obtained, after working for four years as a consultant , by preparing a thesis and sitting for a case discussion and an oral exam) 2002, Professor, Department of Child and Adolescent Psychiatry, Hacettepe University Faculty of Medicine. 2004, ‘Psychiatric Symptoms of Adolescents Admitted to an Adolescent Unit with Physical Complaints, ’Kışlalı MF, Hacettepe Univ.School of Medicine, Dept. of Pediatrics, Adolescent Section, Ankara,Turkey. Medicine, Dept. of CAP, Ankara, Turkey. 1)Çuhadaroğlu, F., "Identity Confusion and Diagnostic categories". Türk Psikiyatri Dergisi (Turkish Journal of Psychiatry), 1(2):59-63, 1990. Psikiyatri Dergisi (Turkish Journal of Psychiatry), 3(3):222-226 , 1992. Psikiyatri Dergisi Dergisi (Turkish Journal of Psychiatry), 4(3),183-186 ,1993. Psikiyatri Dergisi (Turkish Journal of Psychiatry), 4(3):189-194 , 1993. Psychiatric and Physical Symptoms’. The Turkish Journal of Pediatrics, 41(1):73-9, 1999. 7)Çuhadaroğlu, F. and Yazıcı K. , ‘Psychiatric Symptoms Among Turkish Adolescents’. The Turkish Journal of Pediatrics, 41(3):307-13, 1999. 8)Çuhadaroğlu, F., ‘ Folie a Famillie: Separation and Individuation’. European Child and Adolescent Psychiatry, 10(3):194-9, 2001. 9)Çetin, Çuhadaroğlu F., ‘Suicide Attempts and Self-Image among Turkish Adolescents’. Journal of Youth and Adolescent 30(5):641-651, 2001. 10) Çetin Çuhadaroğlu F., ‘Identity Confusion as a Sign of Self Pathology’. Türk Psikiyatri Dergisi (Turkish Journal of Psychiatry), 12(4):309-314, 2001. Physical Complaints Admitted to an Adolescent Unit’, Clinical Pediatrics, 44(2):121-130, 2005.
disorder’. J Child Adolesc Psychopharmacol. 16(6):803-4, 2006. 14)Cengel-Kültür E, Cuhadaroğlu-Cetin F, Gökler B. ‘Demographic and clinical features of child abuse and neglect cases.’ Turk J Pediatr. ;49(3):256-62, 2007. 16)Kanbur N, Mesci L, Derman O, Turul T, Cuhadaroğlu F, Kutluk T, Tezcan I. ‘Tumor necrosis factor alpha-308 gene polymorphism in patients with anorexia nervosa’. provision’. Int Rev Psychiatry. 20(3):217-24, 2008. 18)Agırtan C, Aker T, Aydın C, Beyazova U, Cetin FC, Demirel B, Derman O, Gökler B, İşeri E, Kale G, Kılıç B, Kultur E, Oral R, Özmert E, Şahin F, Uslu R, Taş F, Yurdakök K . ‘Establishment of interdiciplinary child protection teams in Turkey 2002-2006: Identifying the strongest link can make a difference!’ Child Abuse &Neglect. 33:247-255, 2009. 19)Baskak B, Saka MC, Gonullu E, Artar M, Kizil ETO Yazici MK, Cuhadaroglu F, Palaoglu O, Atbasoglu EC ‘Validity and Reliability of the Revised Physical Anhedonia Scale-Turkish Version in University Students’ Nöropsikiyatri Arşivi (Archives of Neuropsychiatry),46: 43-48,suppl, 2009. 21) Akdemir D, Çetin FÇ, Özusta Ş, Karadağ F. ‘Relationship Disorders and Cognitive Functioning in Young Children’ . Turk J Pediatrics, 52(5):512-519, 2010. Individuation in Adolescent Twins’, Adolescent Psychiatry, 2(1): 52-60,2012. 24) Cetin, FC. ‘Child and adolescent psychiatry in Turkey and the Turkish Association for CAP’ European Child Adolesc Psychiatry,21(12):715-716, 2012. 25) Çuhadaroğlu FÇ, Akdemir D, Tüzün Z, Çak T, Şenses-Dinç G, Taşğın-Çöp E, Evinç G.
Disorder’, Turk J Pediatrics, 55(2):2013.
suicidal self-injurious behavior’, Anatolian Psychiatry Journal, 14(1): 69-76, 2013. Sağlığı ve Hastalıkları Dergisi (Journal of Pediatrics), 34(3):241-245, 1991. 3)Çuhadaroğlu, F., "The Teenage World: Adolescent's Self-Image in Ten Countries" by D.
Offer (Book review). Türk Psikiyatri Dergisi (Turkish Journal of Psychiatry), 2(1):73-74, 1991. Dergisi (Turkish Journal of Psychiatry), 5(3):236 , 1994. 5)Çuhadaroğlu FÇ, Mesleki Kimlik Gelişimi (Development of Professional Identity). Turkish Journal of Child and Adolescent Mental Health , 8(2):89-104, 2001. 6)Taşğın E, Çuhadaroğlu-Çetin F., ‘Major Depression in Adolescence: Risk factors, protective factors and resiliency ‘,Turkish Journal of Child and Adolescent Mental Health ,13(2):37-42, 2007. Disorder in Turkey", Atten Defic Hyperact Disord.2;5(4):353-60. 2013. Adolesc Mental Health, 20(2):97-109, 2013. Quatre’. 4th MediterraneanCongress of Social Psychiatry, Ankara, 1983.
International Society for Adolescent Psychiatry (ISAP), Athens, Greece, 1995. Adolescent Psychiatry (ISAP), Aix-en-Province, France,1999. 4) Çuhadaroğl Çetin F. ‘Consent in Adolescence’, Collaborative Workshop of Royal Academy of Pediatrics and Turkish Pediatric Association, Ankara, 1999. 5)Gökler, B., Çuhadaroğlu F., Unal F., et al ‘Attachment and Self –Image among Turkish Adolescents’, The Millenium Congress (The Promised Childhood), Tel Aviv, Israel, 2001. Millenium Congress (The Promised Childhood), Tel Aviv, Israel, 2001. 7)Çuhadaroğlu Çetin F., ‘Adolescence in the Changing Society’, 2nd International Congress on Adolescence, Capadoccia, Turkey, 2001. 8)Çuhadaroğlu Çetin F., ‘Adoleszenz und Entwicklungslinien Jugendlicher in der Türkei’,(Adolescence and Psychosocial Development of Turkish Adolescents) V.Deutsch- Türkischer Psychiatriekongress (Turkish-German Psychiatry Congress), Essen, Germany, 2003. 9)Schepker R, Çetin FÇ,’Models of Outpatient Care with and without Inpatient Facilities in Turkey and Germany’, 16th World Congress of the IACAPAP, Berlin,2004. 10)Çetin FÇ , ‘National Mental Health Policy for Children and Adolescents and Future Training Needs in Turkey’, 16th World Congress of the IACAPAP, Berlin, 2004. ‘Developmental Characteristics and Psychosocial Problems of Turkish Adolescents’. 16th World Congress of the IACAPAP, Berlin, 2004. Congress of the IACAPAP, Berlin, 2004. Problems in Adolescence: A Situational Analysis of Two Cities in Turkey’, International Congress of the European Assoc. for Research on Adolescence (EARA), Antalya, 2005. Social Sciences and Health, İstanbul, 2005. 22)Çetin FÇ. ‘Development as a risk in Adolescence’, XIII. ESCAP Congress, Florence, 2007. 26)Çetin FC ‘Gender Differences in Suicide Attempts of Adolescents’.Symposium on Suicide in Adolescence, ESCAP Sponsored Congress, Budapeste, 2009. Psychiatry’, 19. World Congress of IACAPAP, Beijing, 2010. 29)Zeki A, Çetin FÇ. ‘A Survey of Self-Injurious Behavior Among Adolescents in North Cyprus’.International Conference on ‘From Adolescence to Adulthood’, Cyprus, 2010. -Injurious Behavior’ ,8th Congress of ISAPP, Berlin, 2011. Diagnoses’, Excellence in Child Mental Health, İstanbul, 2011. Adolescents’. 12th European Congress of Psychology, İstanbul, 2011. Congress of IACAPAP, Paris, 2012. Conference of Iranian Assoc. for CAP, Tahran, 2012. German Psychothereapy Association, İstanbul, 2012. Development’, International Conference of ESCAP, Dublin, 2013. Adopted Children in Turkey, 16th World Congress of the IACAPAP, Berlin, 2004. School Menta Health, İstanbul, 2006. 4)Dinç GŞ, Çetin FÇ ‘A Case of Anorexia with the Dynamics of Adoption’, XIII. ESCAP Congress, Florence, 2007. 5 )Çöp E, Çetin FÇ, Tuzun Z. ’Severe Mood Dysregulation in Children with ADHD’. ADHD’. 59. Annual Meeting of AACAP, Honolulu, 2009. 7) Çetin FÇ, Çak T, Dinç GS, Tuzun Z, Evinç G, Tasgın E.‘Comorbidity in Adolescents who were diagnosed as ADHD in Childhood’. Annual Meeting of American Psychiatric Assoc. (APA), New Orleans, 2010. Turkey’. 14th European Society for Child and Adolescent Psychiatry Congress, Helsinki, 2011. 11) Ersöz-Alan B, Kul M,Foto-Özdemir D,Ünal D, Çuhadaroğlu FÇ. ‘The Anorexic Sisters’. 14th European Society for Child and Adolescent Psychiatry Congress, Helsinki, 2011.
in regard of Self-Injurious Behavior’. AACAP-CACAP Joint Meeting, Toronto, 2011.
of Adolescents in an Outpatient Clinic’, 20th World Congress of IACAPAP, Paris, 2012. Group of Adolescence in Turkey’. International Conference of ESCAP, Dublin, 2013. 1)Çuhadaroğlu, F., "Self-Esteem in Adolescents and Its Relation to Various Psychopathologies’. 5)Çuhadaroğlu, F, ‘OCD in Children and Adolescents’’. 3P Dergisi, 3(2):36-44,1995. 6)Çuhadaroğlu, F., ‘Pharmacotherapy in Psychiatry’by A. Turgay and S.
Birsöz (Book Review). Çocuk ve Gençlik Ruh Sağlığı Dergisi, 3(2):124, 1996. 7)Çuhadaroğlu, F, ‘Frequent Psychiatric Problems in Children’. Hacettepe Tıp Dergisi,1999. Yayınları,1:161-166 Ege Üniv. Matbaası, İzmir ,1999. Bozuklukları (Journal of Affective Disorders), 2001. Adolescence’ Adolesan (Katkı) 21(6):869-876, 2001. 13)Çuhadaroğlu F, Özgüner ZT ‘Gender Identity Disorders and Sexual Abuse’ Adolesan (Katkı) 21(6):877-883, 2001. 14)Çuhadaroğlu Çetin F, ‘Suicide attempts in Children and Adolescents’, Katkı Pediatri Dergisi, 22(4)450-453, 2001. 1)Çuhadaroğlu F. ‘Self-Esteem and Its Relation to Various Psychological Factors in Healthy Adolescents’. XI. National Congress of Psychiatry and Neurological Sciences Adana, 1985. 2)Çuhadaroğlu F. ‘Psychiatric Symptom Profile of Adolescents’,XII. National Congress of Psychiatry Psychiatry and Neurological Sciences, Marmaris , 1986. 3) Çuhadaroğlu F. ‘Comparison of Self- Esteem in Neurotic, Psychotic and Healthy Adolescents’, XIII.National Congress Psychiatry and Neurological Sciences, İstanbul, 1987. Neurological Sciences. Ankara , 1988. 5)Çuhadaroğlu F. ‘Self-Esteem and Its Relation to Psychopathology’, Symposium on the Problems of University Students, Bilkent Univ., Ankara, 1989. 6)Çuhadaroğlu F. ‘ Identity Status of University Students’, Symposium on the Problems of University Students, Bilkent Univ., Ankara, 1989. 7)Çuhadaroğlu F. ‘The Training Needs of the CAP Trainees’, 2nd National CAP Congress, İzmir, 1992. 8) Çuhadaroğlu F. ‘The impact of Self-Esteem in Adolescent Development’, 2nd National CAP Congress, İzmir, 1992. 9)Çuhadaroğlu, F, Sonuvar B , Özusta Ş. , ‘Standardization of Offer Self-Image Questionnaire for Turkish Adolescents’. 7th National Psychology Congress, Ankara ,1993. 10) Çuhadaroğlu F. ‘ Multidimensionality of Identity’, 5th National Congress of Child and Adolescent Psychiatry, Ankara,1995. 11) Gokler B, Yavaş İ, Çuhadaroğlu F, Sonuvar B. ‘An Investigation on the Diagnostic Validity of Asperger Syndrome’, 5th National Congress of Child and Adolescent Psychiatry, Ankara,1995. 12) Çuhadaroğlu F. ‘A Research on the Development of Identity among University Students’, 5th National Congress of Child and Adolescent Psychiatry, Ankara,1995. 13) Çuhadaroglu F. ‘Pathogenesis in Anorexia Nervosa’. 1st Adolescent Psychiatry Symposium, İstanbul, 1996. 14) Cuhadaroglu F., ‘Ethics in Child and Adolescent Psychiatry’, 6th National Congress of Child and Adolescent Psychiatry, Pamukkale, 1996. 15) Çuhadaroğlu F. ‘Management of Behavior Problems in Children and Adolescents’. 19th Pediatry Conference, İstanbul, 1997. 17) Çuhadaroglu F. ‘Is it ego Identıty or Self Identıty?’. 34th National Psychiatry Congress, İzmir, 1998. 18)Çuhadaroğlu F. ‘Identity in Adolescence’. Course on Adolescent Development, Ankara, 1998. 19) Çuhadaroğlu F. ‘Adolescence…’. 9th National CAP Congress, Adana, 1999. 20) Çuhadaroğlu F. ‘Psychosocial Effects of Earthquake on Children and Adolescents’. 43rd National Pediatry Congress, Ankara, 1999. 21) Çuhadaroğlu F. , ‘Identity and Crisis’, 5th Adolescent Psychiatry Symposium, Kuşadası, 2000.
and Adolescent Psychiatry, Fethiye, 2000. 25) Çuhadaroğlu F. ‘Developing a Professional İdentity as a Child and Adolescent Psychiatrist’. 11th National Congress of Child and Adolescent Psychiatry, Antalya, 2001. 26) Çuhadaroğlu, F. ‘Clinical and Etiological Characteristerisctics of Anorexia Nervosa’. 4. Gazi Günleri, Antalya, 2002. 27) Çuhadaroğlu F. ‘Changes in the Society and the İdentity Confusion’, 13th National Congress of Child and Adolescent Psychiatry, Ankara, 2003. Adolescence, 14th National Congress of CAP, Bursa, 2004. Congress of CAP’, Bursa, 2004. Adolescence.’, 9th Adolescent Psychiatry Symposium, İstanbul, 2004. Congress of CAP, İstanbul, 2005. 37) Çuhadaroğlu F Akdemir D. ‘Psychological and Psychiatric Characteristics of a Group of Clinical Adolescence’. 42th National Psychiatry Congress, İstanbul, 2006. Congress of CAP, İzmir, 2007. Symposium of Turkish Assoc. for Psychiatry, İzmir, 2007. National Adolescent Health Congress, Ankara, 2008. 46) Çuhadaroğlu FÇ.’ Diagnostic Confusion in Adolescence’, 17th Anatolian Psychiatry Conference, Zonguldak, 2008. Adolescent Psychiatry Symposium, Ankara. 2009. Adolescence Psychiatry Symposium, Trabzon, 2011. 54) Çuhadaroğlu FÇ. ‘Is it normal Development or Psychopathology?’ , 16th Adolescence Symposium, Samsun, 2012. Congress of CAP, Edirne, 2013. Symptoms’. 23rd National Congress of CAP, Edirne, 2013.
and Eating Disorders in Adolescence) Ayrıntı Matbaası, Ankara, 1997. Based Learning: A Guide for the Educators) . Aksay Matbaacılık, Ankara, 2001. Psychopathologies in Adolescence: A Situational Analysis). TUBA Yayınları, Ankara , 2003. 4)Çuhadaroğlu F, Coşkun A, İşeri E, Miral S, Motavallı N, Pehlivantürk B, Türkbay T, Uslu R, Ünal F .(eds) Çocuk ve Ergen Psikiyatrisi Temel Kitabı (Child and Adolescent Psychiatry Textbook) Türkiye Çocuk ve Genç Psikiyatrisi Derneği, Ankara , 2008. Çocuk Sağlığı Yayınları, RNE Matbaası, Ankara, 2011. 1)Çuhadaroğlu, F., "Psychosocial Aspects of Pediatrics and Psychiatric Disorders". Çeviri, ‘Çocuk Hastalıkları Tanı ve Tedavi’ (A Chapter in Current Pediatric Diagnosis and Treatment) içinde. Çeviri editörü F. Sarıalioğlu. Bölüm 25. Güneş Kitabevi Ltd. Şti., Ankara, s:929-983 , 1991. 2)Öztürk, M.O., Uluğ, B., Çuhadaroğlu, F., Rezaki, M., Kaplan ,İ.: ICD-10: Ruhsal ve Davranışsal Bozukluklar Sınıflandırması’,( ICD-10). Medikomat Basım Yayın San. ve Tic. Ltd. Şti., Ankara, 1993. 1)Çoruh, M., Yörükoğlu, A., Çuhadaroğlu, F., et al. : An International Pediatric Association (IPA) publication in collaboration with UNICEF and WHO: ‘Adolescent Workshop Discussion Group Reports and Recommendations’. International Child Health: A Digest of Current Information, 5(1):33-36 , 1994. 2) WHO, UNICEF and IPA Collaborative Workshop Report on Alcohol and Drug Abuse in Adolescence, Bishkek, Kirgyzistan, 1997. 3) Çuhadaroğlu F. ‘18th World Congress of IACAPAP’. AACAP News, September/October 2008. Reproductive Health, International Children’s Center Publication, Meteksan, Ankara , 2003. Publication, Meteksan, Ankara , 2003. Youth, D. Ulusoy (ed), IOS Press, Netherlands, 2008. E- Book on Child Mental Health, Joseph Rey (ed), 2012 . 1)Çetin Çuhadaroğlu, F., "A Research on Self-Esteem of Adolescents", in Proceedings of the XXI. National Congress of Psychiatry and Neurological Sciences. M. Ünal(ed). ss:107-108. Mimeray Ofset, İstanbul , 1985. 2)Çuhadaroğlu, F., "Psychiatric Symptoms among University Students", in Proceedings of the XXII. National Congress of Psychiatry and Neurological Sciences. R. Saygılı(ed).ss:15-21. Ege Üniversitesi Basımevi, İzmir,1986. 3)Çuhadaroğlu, F., "Di-egophrenia", in Proceedings of the XIV. National Congress of Psychiatry and Neurological Sciences. K. Aydınalp (ed). ss:625-630. Saypa, Ankara , 1988. 4)Çuhadaroğlu, F., "Identity Problems among University Students", in Psychosocial Problems of University Students. N. Şahin(ed). ss:35-39. Bilkent Matbaası, Ankara ,1989,. 5)Çuhadaroğlu, F., B. Sonuvar ve Ş. Özusta , ‘Standardization of Offer Self-Image Scale for Turkish Adolescents’, in Proceedings of the VII. National Congress of Psychology, R.Bayraktar and İ.Dağ (ed). Hacettepe Üniversitesi Basımevi, Ankara ,p:137-141, 1993. (ed. ), p:157-162, Ankara Univ. Press, Ankara ,1994. 7)Çuhadaroğlu, F., ‘A Family Treated by Integrated Family Therapy’ , in Family Therapies, E. Kerimoğlu (ed. ),p:73-79, Ankara Univ. Press, Ankara , 1996. 8)Çuhadaroğlu, F.,’ Self Psychological Characteristics of Eating Disorders’ in Eating Patterns and Eating Disorders in Adolescence içinde, F Çuhadaroğlu (ed. ).Ayrıntı Matbaası, Ankara,48-53,1997. 9)Çuhadaroğlu, F., 'Learning Disorders in Children’ in Textbook of Psychiatry, E. Köroğlu (ed.). Hekimler Yayın Birliği, Ankara, ss:1057-1064 , 1998. 10) Çuhadaroğlu, F. ‘Psychological Development and Problems in Adolescence’ in Adolescent Health and Family Health Programs, C Turaman (ed. ).Ministery of Health Press, Ankara, 1998. 11) Çuhadaroğlu, F., ‘Anorexia Nervosa’. in Psychosocial Aspects of Pediatrics, A.Ekşi (ed. ), İstanbul Üniv.Press, İstanbul, 1999. 12)Çuhadaroğlu, F., ‘Psychosocial Development in Adolescence’, in Adolescent Health, Ministery of Health Press, Ankara ,2002. 13)Çuhadaroğlu, F. ‘Depression in Adolescence’ in Adolescent Health, Ministery of Health Press, Ankara , p:305-309, 2004. 14)Çuhadaroğlu F. ‘Development of the Self’ , in Clinical Psychiatry, E.Işık, E Taner, U Işık (ed). Golden Print Matbaası, İstanbul, s:23-28, 2008. Psychiatry,, F. Ç. Çetin et al. (ed). Turkish Assoc. for CAP, Ankara, s: 122-128, 2008. 16)Çuhadaroğlu Çetin F, Tüzün Z .’Psychiatric and Psychological Evaluation of Adolescents’ in Textbook of Child and Adolescent Psychiatry, F. Ç. Çetin et al. (ed). Turkish Assoc. for CAP, Ankara, s: 174-185, 2008. Adolescent Psychiatry, F.Ç Çetin ve ark. (ed). Turkish Assoc. for CAP,, Ankara, s:854-861, 2008. Pediatrics, T. Kutluk et al (ed.). Ankara, 2009. 19) Çetin FÇ, Akdemir D. ‘Self-Esteem in Adolescence’, in Youth in Turkey, Dereboy F. et al (ed. ), Turkish Assoc. for CAP, Ankara,2011. 1)Çuhadaroğlu, F., ‘Adolesansda Psikolojik Gelişim’ (Psychological Maturation in Adolescence). Katkı Pediatri Dergisi (Journal of Pediatrics),17(5):783-788 , 1996. Problems of Adolescents).Çocuk ve Gençlik Ruh Sağlığı Dergisi (Journal of Child and Adolescent Mental Health),4(3):179-184, 1997. Outer Worlds). Çocuk ve Aile Dergisi (Journal of the Child and the Family) , 24:40-42, 2000. Association of Psychoanalytic Self Psychology Newsletter, 2000. 5)Çuhadaroğlu, F., ‘ Ergenlik Döneminde Psikolojik GelişimÖzellikleri’ (PsychologicalDevelopmentin Adolescence) Katkı Pediatri Dergisi, (Journal of Pediatrics), 21(6):863-868, 2001. Adolescence) Katkı Pediatri Dergisi (Journal of Pediatrics), 21(6):869-876, 2001. Pediatri Dergisi (Journal of Pediatrics ),21(6):877-883, 2001. 8)Çuhadaroğlu F ., ‘Ergenlerde İntihar’ (Suicide among Adolescents). Katkı Pediatri Dergisi (Journal of Pediatrics) , 2002. 9) Çuhadaroğlu FÇ., ‘ CAP in Turkey and Turkish Assoc. for CAP’ AACAP Newsletter, June 2013. 10) Akdemir D, Çuhadaroğlu FÇ, 'Ergenlerde Psikososyal Gelişim Özellikleri ve Sorunlar'. Katkı Pediatri Dergisi, 34(6):709-718, 2013.